Remember the function served by plants and structures is more important than their appearance. In other words, don't base your planting decisions solely on what a plant looks like. 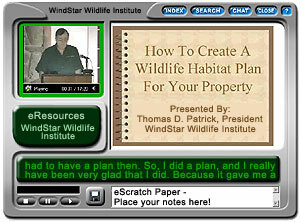 Following are WindStar Wildlife Institute's plant recommendations for wildlife habitats in Virginia. Virginia's landscape includes a wide range of natural communities which include three major regions--the Coastal Plain, from the Atlantic Ocean in the east to the Fall Line in the west; the Piedmont, from the Fall Line in the east to the Blue Ridge Mountains in the west; and the Mountains, including the Blue Ridge Mountain, the Ridge and Valley, and the Appalachian Plateau Provinces. The Virginia Native Plant Society can provide lists of plants for a specific region.